So next in my Christmas gift ideas series is personalised and unique gift ideas. Each freatured items is purposely affordable, please do browse each suppliers site though to discover their full ranges. A few weeks ago I went along to the Dorset Lemur blogger/business link up. 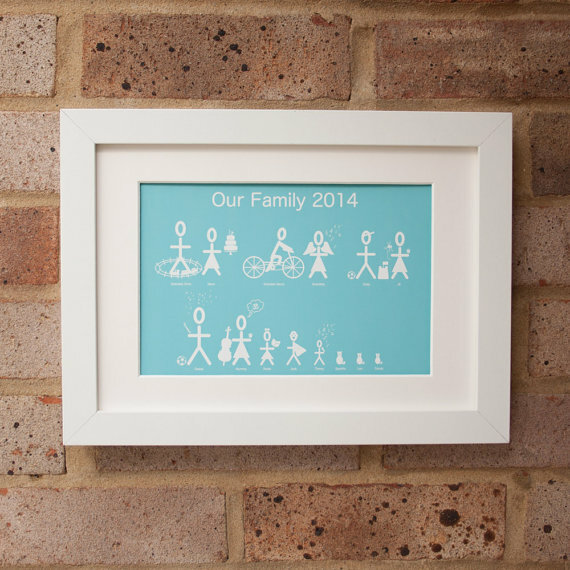 Despite being a very nervous newbie I spent a lovely time chatting to Cari Davies-Moore, owner of ErryBerry Design She makes beautiful personalised pictures and quirky images for your homes. As her Christmas deadline for the family portraits has now passed she is selling vouchers (£26.50) now to enable people to arrange their own portraits in the new year. You can see an example of the incredible detail that goes into them here. 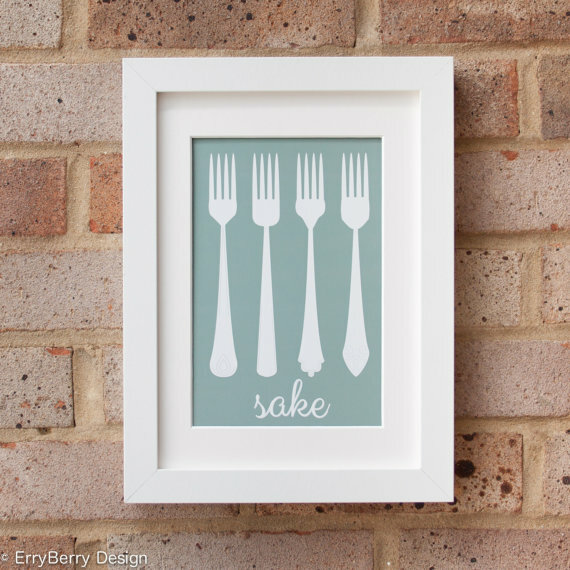 For your keen cooks Cari has produced a range of kitchenalia prints (unmounted £18.00, mounted £25.50). I've already ordered my "Star Baker" and "Forks" prints, they may be for Christmas presents...they may just find their way onto my own kitchen wall! At the Link Up I also discovered the brilliant Ware Street Market This online collective of small designers and producers has a lovely range of gift ideas for every family member and your homes. 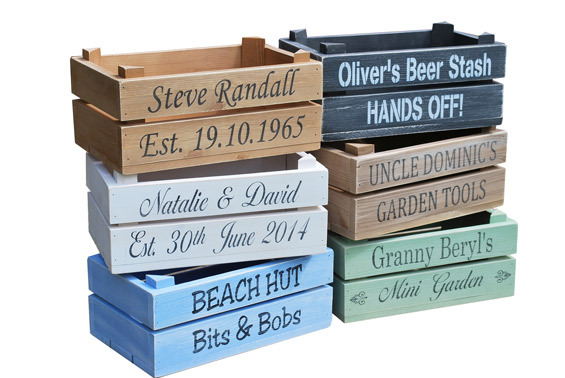 These Personalised small crates (£23.50) would be brilliant to use as the base for a family hamper or gardening kit for a green fingered friend. Taking advantage of a quiet hour at work I thought I would take a browse through some of the brilliant shops found through Etsy. Etsy is surprisingly easy to navigate your way through, with easy to use search options and the ability to look at a shop's full range at the click of a button. I specifically wanted to find some more unusual jewellery pieces and Etsy had them in droves. For the dapper gent in your life NJDDesigns have lots of iconic design cufflinks, covering legendary music, films and TV programmes. 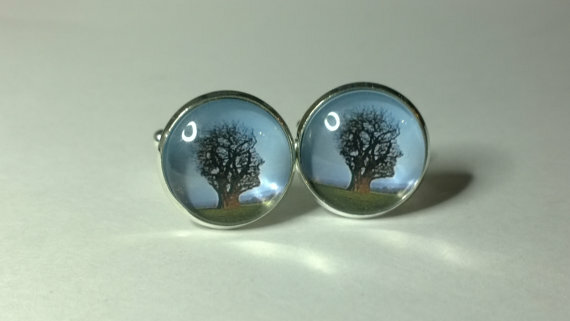 These Pink Floyd Cufflinks (£9.54) would be brilliant for any music fan. 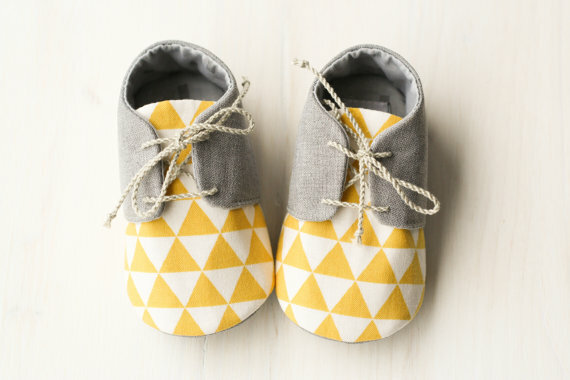 Not leaving all the baby boys out I found M'art Baby Accessories selling these gorgeous Yellow & Grey baby shoes (£16.50). They look super stylist but still incredibly comfortable too. Hopefully that's given you a little inspiration or a starting point? Next week will be the final gift guide - food & drink, before I start sharing some Christmas recipe ideas.